Vista Dulce, our luxury condominium, RIGHT ON THE BEACH (don't be fooled by claims by others of "oceanfront") , has been recently updated with new state of the art A/V and high speed Internet equipment, painting and furnishings. Our home is conveniently located only 2.25 miles north of the town of San Miguel where shopping, dining, sight seeing and many recreational activities are available. There is a pier on shoreline that offers a dock for your boats and family fun. Vista Dulce's most appealing features are its wide terraces and breathtaking views. Vista Dulces' amenities include a freshwater heated pool with fresh water shower. Vista Dulce offers daily maid service, washer/dryer, purified water (yes, you can drink it), FREE LONG distance calling to US, Canada, Mexico & 60 other countries. READ ALL 62 REVIEWS TO CONVINCE YOU THAT VISTA DULCE IS AN EXCELLENT CHOICE AND THE BEST VALUE ON COZUMEL! Spectacular Sunsets, Terraces, Views: Vista Dulce's most appealing features are it's wide terraces and breathtaking views. Vista Dulce has a comfortably furnished 65-foot oceanfront terrace with unobstructed views of the coastline and exotic reef formations. This spectacular view offers fabulous Cozumel sunsets. There is also a smaller balcony equipped with a gas grill overlooking the luscious green of the Cozumel's inner jungle just off the dining room. You can choose to relax on the terrace with its cushioned patio chairs and tables or sway in genuine Mexican hammocks. Take advantage of the many other options that Vista Dulce offers such as our shopping service or in-house cook service featuring delicious flavors of the Mexican and Mayan culture. We also offer baby-sitting services, car rental options, many exotic tours and unusual excursions. You will feel truly pampered in Vista Dulce, your perfect Home away from Home for your Cozumel vacation. Immaculately furnished with fine art and leather, imported objects with touches of local accents give this home a feeling of Mexican luxury living. Beautifully Italian and Mexican handcrafted furniture of mahogany, leather, and other fine woods create a luxurious setting. The walls come alive with colorful fine art prints and other hand made works including Talavera pottery and comfortable rugs and mats in all rooms. Our home's generous amenities include the following: a striking freshwater heated pool with outdoor poolside bars, a fresh water shower; included is daily maid service (except Sundays), washer/dryer, purified tap water (yes, you can drink it), free long distance to US, Mexico, Canada & 60 other countries, local telephone service, answering machine, wireless super high-speed Cable Internet access and Cable TV with American and NY Network channels. You can watch your favorite sporting events without leaving your living room. We also have 100's of CD's and DVDs. World class snorkeling and diving on the Cozumel's famous reefs are available at your doorstep. Just walk right out your door onto the beach and dive into the Caribbean. We got tired of staying in places that were poorly furnished and uncomfortable. We wanted a place that felt like home, so we furnished Vista Dulce for ourselves. We also wanted access to all the latest technologies, so we could live there if we decided to. It was only afterwards that we thought about renting out our home. We take maintaining Vista Dulce in top condition very seriously, so you will feel right at home. Janey and Ledge, Denver. We wanted a place that was on a white sand Caribbean beach, within 4 hours of Denver and a place that never got cold in the winter. After searching Florida, Puerto Rico, BVI's and the mainland of Mexico, we kept coming back to Cozumel. When we first walked in and saw only blue sky and turquoise waters, it took our breath away; hence the name, Vista Dulce (Sweet View). Vista Dulce is quiet and takes up an entire floor, so we have no one on either side making noise. You walk right out onto the terrace that overhangs the beach and the Caribbean. It is private but only a few minutes to town. Las Brisas is the best location on the island with only 14 units with most not for rent. It's like having the whole place to yourselves. Natural stone counter tops, large showers, 2 fluffy 100% cotton bathrobes, large 100% cotton bath sheet towels, hand towels and wash cloths. If you need more towels, just ask Zoraya. There are hair dryers in every bathroom. Vista Dulce sits on our white sand beach with a pier. We are RIGHT ON THE BEACH and right on the Caribbean. Vista Dulce looks directly over the colorful blue Caribbean. Vista Dulce sits on our white sand beach with a pier. We are RIGHT ON THE BEACH. Look directly at the Caribbean from the terrace, the living room and the 2 master bedrooms. We have 2 phones, one for local telephone service and the other is our free VONAGE long distance service to USA, Mexico and Canada and to over 100 countries . The powerful 7.5 ton roof top AC unit will keep you comfortable even in the warmest weather and it is relatively quiet. You don't need neat in the tropics. Extra thick cotton towels and high thread count Egyptian cotton sheets. Thick terry cloth robes. Beach towels. Full sized Maytag dryer. Please don't use it to dry your dive gear. Thanks. Why would you need a fireplace in Cozumel? 100% cotton bath sheets, hand towels, and wash cloths. We also provide beach towels! Not on site, but you can work out at EGO in town for about $10/day or less if you are a good negotiator. High speed wireless connection is provided. WiFi password is in the guest book. Zoraya our maid will do the dishes as needed. You are on vacation! After 3 broken dishwashers, we decided to replace the dishwasher with more drawers. New Sears Stainless Steel fridge with lower freezer compartment. Large enough for an army. New Frigidaire Stainless Steel drop-in stove with with glass cook top and conventional and convection ovens. New Frigidaire Stainless Steel over the stove vented very large microwave. Coffee grinder, espresso maker/foamer, 10 cup drip coffee maker. There should also be plenty of filters. If not just ask Fulvio or Zoraya. Cuisinart large toaster oven for toast and heating food. You might even be able to cook a small chicken, but I would recommend the real oven for that. Real 'Fiestaware' colorful plates and dishes with 2 sets of stainless steel flatware so you will never run out of knives, forks and spoons.. Equipped with all the latest stainless steel appliances, fit for a gourmet cook. In-Home Cook service is available. (3) New flat screen HD TV in LR and Master bedroom with standard TV in other the master bedroom. We have a Blu-Ray player, DVD/CD player and VCR. Dish Network with 100's of American channels including all major US Network stations out of New York. You will not get CableMas with Mexican channels. Top of the line Samsung receiver with full 5.1 surround sound system and powered base. New Samsung BluRay, DVD, CD player. Literally 100's of paperbacks stored in the entry cabinets. If you don't have an E-reader or just like to read books feel free to search for a best selling novel. Many board games with decks of cards and even a custom set of poker chips. Over 100 CD's with all types of music. Includes docking station for IPod. Over 60 movie titles on DVD and VHS. We have spacious terraces both front and back. One overlooks the Caribbean and the other has the gas grill and overlooks the jungle. Full length terrace overlooking the beach and the Caribbean. we have assorted snorkels, masks and fins. We even have some fishing rods. At the nearby Jack Nicklaus designed course located at the Cozumel Country Club about 2 miles north. They rent clubs and carts and even have a small bar/grill. Pool is heated freshwater and tiled and is only available to residents and guests. We also have shopping and cook service available. Las Brisas was a very comfortable place to stay. It was roomy and had anything we needed to make our stay easy. There were four adults and we all had plenty of room to spread out. We enjoyed the terrace very much and spent time watching sunsets and the action on the public beach. The security guard was very friendly and Fulvio was extremely responsive. We hope to be back! Great spot. Could live on the balcony. Great place to relax. Perfect location, property is everything as it's advertised to be. We were a family of five and it couldn't have been better! Condo was as represented. Had a couple small issues during stay but Property manger got right on them same day. 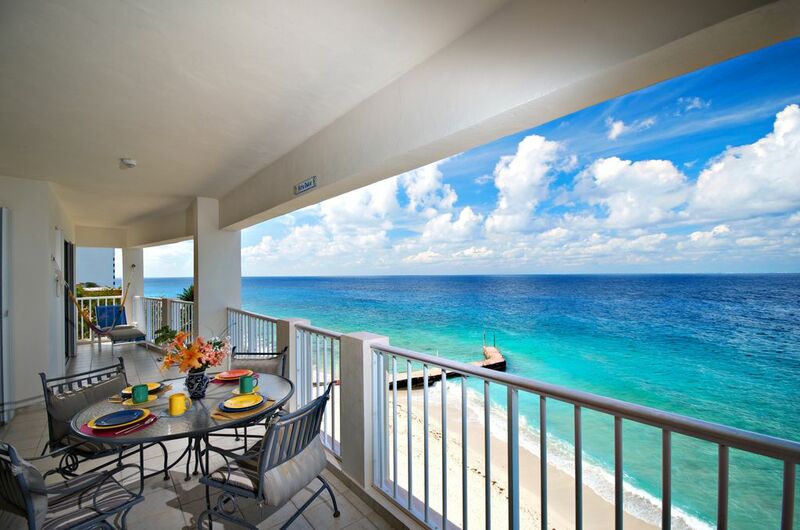 We love Las Brisas Condos and this unit is one of the BEST! It is so very, very comfortable and it has everything. The staff is delightful. There is only one thing that could make it better: a LONGER stay! The unit was perfect for a family vacation with its direct access to the beach. Can’t say enough about how much our family enjoyed the property. It had all our family needed to enjoy a relaxing vacation. The staff was friendly and the comprehensive guestbook was extremely helpful. The internet access was a bit spotty if you want to do work but served as a convenient excuse not to be connected to the office. Kudos to the property manager for being friendly and responsive. World Class Scuba Diving and snorkeling, zip lining, horseback rides, dune buggy tours to the lighthouse. The windsurfing is world class also. All rates are for up to 2 guests. For every guest over 2 add $25/nt plus tax per guest to the base rate. Base prices listed do not include taxes of 19%. Quotes include a tax rate of 19%. All deposits are fully refundable for 7 days after making your reservation. Thereafter all payments are non-refundable. We recommend that you consider trip insurance.